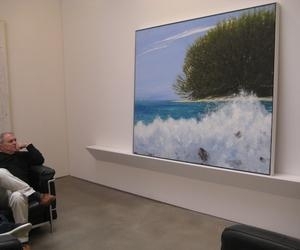 Cuban Art News, Julio Larraz: "This is the golden time for Cuban art"
The artist on daydreams, storytelling, and his "pretexts to paint"
On the eve of his recent gallery opening in Chelsea, Julio Larraz met with Cuban Art News publisher Howard Farber for a second, wide-ranging conversation following their earlier interview. On the agenda: art, collecting, sources of inspiration, and the “imaginative, powerful, awe-inspiring” work of contemporary Cuban artists. There’s one painting of yours that I saw years ago and have never forgotten. The image was of a woman on the beach with a parasol. I tried to buy it, but it ended up not being for sale. Do you remember that painting? JL: Ohhh. It was … Yes, I know it. That woman took care of me when I was a child. She was like a second mother. She loved me. And she came to the United States. I have converted her into a political cacique, we call it, like a chieftain of a section or an area. I have done some paintings of her traveling with two lions, a lion and a lioness, in a small boat in a political campaign, and all kinds of things. They’re all pretexts to paint. The important thing for me is to paint. But I base everything on a mental image I have of a certain place. And these characters, they fall into place as in a chess game. They have a certain relationship. Some of your images and motifs appear in several paintings. I use many times the image and the name of Homer, the poet. I am a great admirer and reader of Homer. But nobody knows anything about him. And since nobody knows anything about him, I’ve made him my own. I use his image and his figure and the thought that he might have lived in what used to be an enclave, a Greek enclave in the southern part of Italy, north of Naples. In Cuma, which bears the same name as a town in Greece. On something like a fjord. They’re all tales of representation, they’re all scenarios where you can set your characters. It’s hard enough to paint without having something in your mind to guide you. Insight a little like—if we may call it that—daydreaming. I see images reflected in my mind and instantly I try to make some drawings before they disappear. And it works. But most of them are not night dreams, they’re daydreams. So do you do drawings? I do drawings and sketches. I do a lot of watercolors that I finish with pastel. The thing is to work. That is the love of my life, to work. The rest is just the stories that you put on to entertain yourself. This, for instance—I always wanted to imagine how the poor Indians must have felt when they saw the Spaniards arriving. Things that I always wanted to know. I mean—how? These were people who were eventually going to take everything you had. They were going to kill your mother, your father, your children. They were going to own everything you owned before. It was the end of paradise for them. The Spaniards arrived like that, in three caravels. The third one is here, you can barely see it. They’re already in. It’s called One Day in October. My life is that. It’s painting. I’m not a storyteller, I never talk about it. I don’t like to talk about the paintings. I think it’s very important that people see something. That they see a painting like this and say, Oh—that’s like where Jane and I were in the Bahamas. And then the painting is not mine anymore, it’s yours. You came to the United States in 1964? We came in 1961. My father and mother, when we arrived here, were penniless. My father ran a newspaper before Batista’s government. He had a doctorate in philosophy and one in economics. He ended up teaching in Marymount College and in St. Thomas Aquinas, and different places. I had no money to study painting. I did, however, defend myself doing political caricatures. I did a lot of them. For the Washington Post, the Chicago Tribune, the New York Times, Time, Newsweek, Ramparts, Rolling Stone. You had a whole professional life. Yes. Then I gave all that up and started painting, which was really what I wanted to do. And my father said, Julio, you have a career doing caricatures. Why are you going to do something else? A few years later, I won a prize from the American Academy of Arts and Letters, and the year after, I won another from them, the Childe Hassam Prize. So then my father said, All right. [laughs] I always knew you could do it. In our earlier conversation, you said you didn’t follow contemporary Cuban art. But you do seem aware of what’s going on in the field. This is the golden time for Cuban art. It fills me with happiness to think that a Cuban artist can make a living—that he can live a life, and will live much better in the future. It was not like that. Painters of the 1930s and 1940s, they were destitute. Victor Manuel. Portocarrero less, but Fidelio Ponce de León… They became alcoholics, they were downtrodden. They were the lowest element in the totem pole of the society of Cuba. The change has been extraordinary. I was talking with a friend about Cuban art, new art, and this and that. And I said, I’m just at the crest of my compatriots. I’m just as good as them, they’re just as good as me. There’s excellent work in Cuba—imaginative, powerful, awe-inspiring. And it’s a good thing that, little by little, they’re going to be included in the rest of this world. I couldn’t agree more. Let’s go into the gallery and take a few photographs. This is a triptych. It’s called Guanahacabibes. It’s a bay in Cuba where they found ancient remains of buildings, structures, down below. Perhaps Mayan. It’s very beautiful. But this is just clouds. Do you remember the film by Orson Welles, Citizen Kane? There’s a shot in there like that. There was an 18th-century Venetian painter, Pietro Longhi, who did a famous painting with a rhinoceros. You definitely captured the rhino. So many different, excellent artworks. Thanks for sharing and spending time with me. Julio Larraz remains on view at Ameringer McEnery Yohe through November 14.